I like the slippers but In the late 90s they were still using an old rotary phone? @John Your guess is as good as mine on that one. It was there, but whether it was still used or not is impossible to say. That said, been in plenty of little bars that still use them, so it’s definitely a possibility. @Jonh One bar I was in, the owner insisted on still using his ‘cos he said the sound was clearer than modern phones. True? This is really beautiful, so many questions come to mind – why this pair of slippers, the shoes, why the telephone, all arranged like this? I’ve been meaning to ask: Aren’t you scared to go into those old and abandoned houses? Judging by your Haikyo collection (which is immensely entertaining by the way) you must have nerves of steel! Thanks. Yes, definitely more questions than answers. 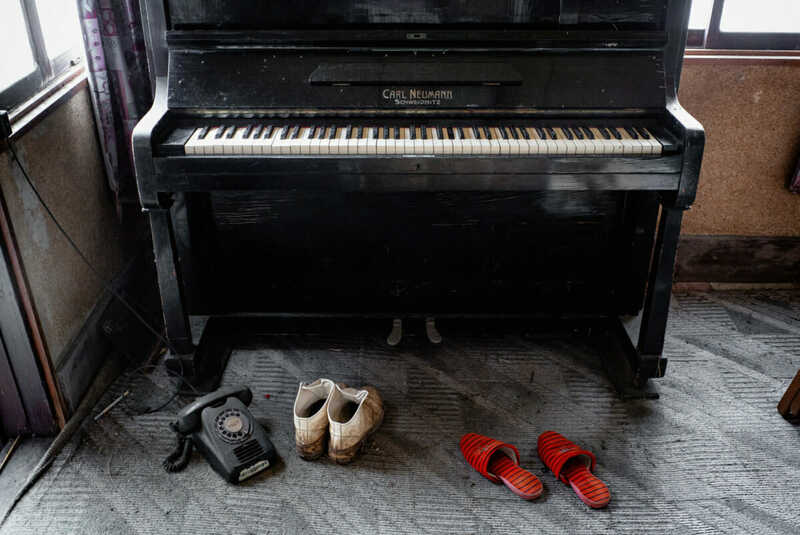 The slippers make sense as the piano was near the entrance, but the dirty shoes on the carpet don’t. Very un-Japanese. Also, the phone was connected up to the wall there, although still unusual to have it on the floor. Perhaps there was a table there once? But nah, no nerves of steel. Always a bit cautious when I first enter, but that’s about it. They are always quiet places, so fairly calming in an odd sort of way. Unexpected noises, however, like a passing car, or something moving ‘cos of the wind, can be a bit startling. If only the piano could talk… how has it made its way from pre-WW II Schweidnitz (today Swidnica in Poland) to Japan? To be honest, I just presumed it was a well known piano maker and so never looked it up. That’s absolutely fascinating. Cheers for letting me know. Really does make you wonder quite how (and why) it ended up where it did in the forested area of western Tokyo. Presumably we’ll never know, although in some ways that’s not a bad thing as it conjures up all kinds of possibilities. An amazing find, and such an atmospheric photograph. Mournful is the word that springs to mind. Thanks. A very welcome find. To be honest, the house didn’t have much else that was photogenic, but this alone made it more than worthwhile. And yeah, mournful sums it up very well. Thank you. That’s really nice to hear.